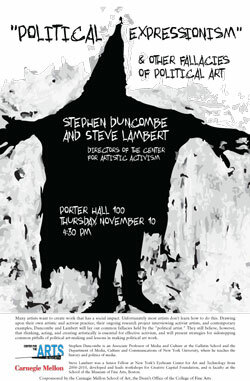 Stephen Duncombe and Steve Lambert are directors of the new Center for Artistic Activism. Stephen Duncombe is an Associate Professor at the Gallatin School and the Department of Media, Culture and Communications of New York, where he teaches the history and politics of media. Steve Lambert was a Senior Fellow at New York’s Eyebeam Center for Art and Technology from 2006-2010, developed and leads workshops for Creative Capital Foundation, and is faculty at the School of the Museum of Fine Arts, Boston. Many artists want to create work that has a social impact. Unfortunately most artists don’t learn how to do this. Drawing upon their own artistic and activist practice, their ongoing research project interviewing activist artists, and drawing from contemporary examples, Duncombe and Lambert will lay out common fallacies held by the “political artist.” They still believe, however, that thinking, acting, and creating artistically is essential for effective activism, and will present strategies for sidestepping common pitfalls of political art-making and lessons in making political art work.